Under the Bridge has further cemented its reputation as one of London’s best live music venues having this month welcomed an incredible array of high profile artists for a series of exclusive shows. Kicking off proceedings was a sold out show from X-Factor runner up Rebecca Ferguson, whose classy set showcased tracks from her much anticipated new album Freedom (click for photos). 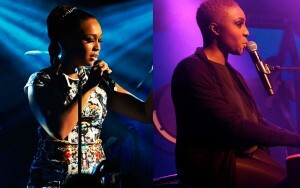 This was followed by Laura Mvula, undoubtedly one of the most acclaimed singers of the year and fresh from her Mercury Prize nomination, who brought the house down with her unique blend of soul, jazz and gospel (click for photos). Multi-million selling indie band Keane performed an incredible show exclusively for Absolute Radio. Drawing mainly from their 9x Platinum-selling debut album Hopes and Fears, the band treated fans to a succession of hits including Somewhere Only We Know (which recently returned to the charts courtesy of Lily Allen’s cover for this year’s John Lewis Christmas advert), Everybody’s Changing, This Is The Last Time, and Bedshaped (click for video). 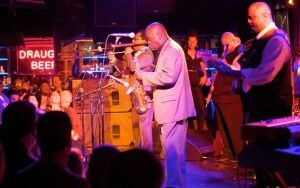 Funk legend Maceo Parker returned for 2 sell-out nights, once again wowing the crowd with his impeccable blend of soul, funk and jazz. A pioneer of groove, Parker is one of the most sampled musicians ever, and his set took in samples of Bootsy Collins, George Clinton and James Brown with a few unexpected dashes of Ray Charles and Barry White. 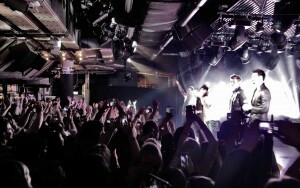 Having been so impressed by the venue at their fan event back in June, legendary boy band Backstreet Boys returned to Under the Bridge to perform an exclusive concert which was filmed for future TV broadcast. One of the best-selling boy bands in history didn’t disappoint and the crowds that had gathered hours before the doors opened were treated to an array of hits including I Want It That Way, Everybody (Backstreet’s Back) and As Long As You Love Me. This phenomenal run of shows culminated in a performance from one of the world’s biggest pop stars and an undisputed music industry hero, Robbie Williams. Having performed at Wembley Stadium this summer, Robbie was back in town for an intimate Heart FM concert in recognition of his Live Artist Of The Year Award. In what was a truly special show, Robbie wowed the audience with a selection of his greatest hits and was joined on stage by Spice Girl and Heart FM presenter Emma Bunton.